The Park Youths attempt to reach the final of the Munster Youth Cup came unstuck in Ennis on Sunday with a deserved win for Ennis side Avenue United who now go on to meet Waterford Bohemians in the final. Cahir, as always can be proud of the trojan effort in trying to overcome the illustrious opposition who are still in FAI Under 17 Cup contention. Played in front of a huge away support - for whom team and management extend big thanks - Cahir matched Avenue ball for ball in the opening quarter with Gearoid Slattery imperious in goal and a back four of Aaron Murphy, Eamon Gleeson, Mikey O'Connor and Keelan Hickey well in control. Slattery was tested with Daragh Sexton having a good effort saved from a corner on the right. Such set-pieces would later be Cahir's downfall with three of the four goals coming from corners and a penalty. One of the Park's best early efforts came on 12 mins with Stephen Duggan feeding Liam Casey from the right-hand side. Casey then had a shot on target well stopped by Declan Deasy in the Ennis goal. Many in the crowd looked back fondly on the last time the Park had reached this stage in the competition, that day unfortunately delivering the same outcome. This tie would spark to life with a 19th penalty awarded by the Limerick referee for handball. Confidently, Paddy O'Malley finished under the body of a diving Slattery. With the home side on top, the pressure came on Cahir to deliver the goods. This they did but United, with well-timed tackling, were well equal to the effort. One of Hickey's trademark frees was wide on 29 mins as the Cahir midfield came more in to the game. Cahirparkafc.com man of the match Dylan Fitzgerald was again the driving force with non-stop running throughout opening up chances for several team-mates. Amongst them was a hard-working Ian Flannery, whose long-range effort on 31 deserved better. Just after, Duggan whipped a low cross across the box. Unfortunately there was no-one there to meet it. With a distinct wind advantage in the open Doora field, United took greater advantage and forced a corner on 34 mins. That was delivered in from the left, innocously over defence and potential finishers to be returned from the opposite side. From this cross, Conor O'Brien was on hand to finish a tap-in for one of the easiest goals conceded by the Park this season. Fitzgerald took up the challenge once again and fed by Niall McKenna, as the half came to an end, Fitzgerald provided a classy cross setting up Duggan at the far post to head inches wide. Two down at half-time and manager Pakie O'Dwyer and coach Jason Coffey would have to be at their most inspiring to lift the lads. We are however lucky to have had such leadership at our disposal at the moment in the club. All the sadder that the partnership served in their final game together for a while in this game. All at Cahir Park send their best wishes to Pakie and family as they create a new life together abroad. On the sidelines, the game was dissected by the sizeable Cahir contingent as they sampled fully the hospitality on offer from Avenue and the Clare League - our gratitude to them for a job well done off the field. Cahir returned a determined outfit and bossed the next twenty mins with Casey and partner-in-crime David Finnane in the heat of the action. With the lively Mikey O'Connor pushed forward, he produced a fine cross-field ball for Fitzgerald on 48. Another accurate cross and the head of Finnane did the rest, the looping header taking some time to find its rightful place behind Deasy in the goal. The Park pushed on and on in the hope of a deserved equalizer and another Duggan attempt was saved by the keepers feet whilst five mins after, a rasping Casey shot flew just over. Another looping header on the hour was tipped over for a corner as the Cahir crowd were whipped up to fever pitch. However they were soon stunned into silence with a quick break from the Avenue defence producing a shot on goal which Slattery parried on to the post, the resulting shot blown offside. Avenue's style apid dividends and they were buoyed by this effort to create a corner on 68. The inswinging corner from the right found the head of O'Brien again to put United two clear. With both sides committed to a good footballing performance and with a game free of any great aggressive streak, the class of the Clare lads shone through as they showed some lovely passages of play in the next ten, in the process killing off any good approach work from the Tipperary representatives. In glimpses, Cahir showed the quality football everyone expected of them but the result became all too predictable as the game wore on. Comfortable on the ball, Ennis were able to add a hardly-deserved fourth with the visiting defence caught away from home allowing Seanie Corry to finish well with three mins to play. In the process Cahir Park finish their season happy in the knowledge that they could be real contenders in twelve months time with only five of their squad over age. 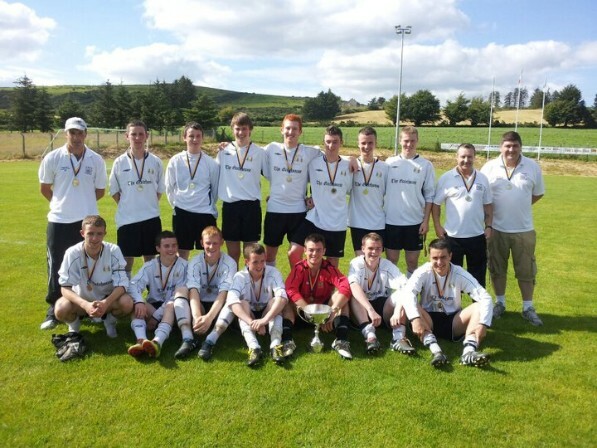 Good luck to Avenue against Bohemians - may the best team take home the Munster Youth Cup for this year. Four goals from the home team against a Cahir side with minds elewhere was value enough for their performance on Saturday in a game where Clonmel were always comfortably on top with Town on top in all areas of the field. Colm McGeever, Greg Henry, Kevin Fahey and Harry O'Connor provided the goals with Jack Marshall providing a deserved goal for a Park side whose best contribution to the clash was in the last quarter-hour. Early chances at either end, first from Clonmel's Michael Connolly and then by the Park's Liam Casey failed to put an impression on the scoreline. An important clearance by the solid Keelan Hickey on 9 mins put paid to a Kevin Fahey attack as Town started as they meant to go on, a constant wave of attack pressurising Tezi Opala's goal. On 13 a Jack Marshall effort was goalbound but for the intervention of home goalie Evan Comerford. Directly after, McGeever broke the deadlock when unopposed he rose with a strong header from a corner on the right powering past Opala. Casey was unfortunate not to equalize with twenty gone when an open goal appeared in front of him after good work by Donal Reade and Marshall. A delicately placed attempt from Casey shaved the left-hand post. Town were ahead on possesion at this stage with Greg Henry, Tom Kirwin and Kevin Kirwin showing well. There was little resistance to Kevin Fahey's raids down the wing as Cahir forget about their defensive duties, Eamon Gleeson and Mikey O'Connor having a busy time of it with Stephen Duggan, employed at right back, having to work hard. With 32 mins gone, Opala was called into action, saving a long-range shot well. Immediately afterward, the aware Henry had a blistering shot go just over. Proving there was still some heart in the team, Marshall had a long range attempt too - this one flying past Comerford's goal. After 40 mins, the unchallenged Henry made the most of an opportunist effort to smash past Opala from the edge of the area, the hosts two ahead. With a min to the break, one of Town's best efforts proved good enough to put three between the sides. Fahey was on hand to start a move that had seen Clonmel scythe through a Park midfield that allowed Henry more space than he should to finish past Opala. In parts of the second half, the Park showed their true grit but with wayward passing, a lot of this good work went to waste, Fitzgerald did have a good effort on goal go just wide after 57. Midway through the half, Thomas Fitzgerald made the best of space to fire home past an injured Opala after rapidly breaking from defence, the visiting goalie then replaced by Woijcek Cymeras. On 69 Finnane showed some of his attacking composure when played through by Fitzgerald, the effort scrambled away by a sharp Town defence. With Anthony Condon and Niall McKenna on and Finnane retiring injured, Cahir were down to ten for the last eight mins. Ironically it was during this period that they were on top in the game. With Marshall finishing a bullet to the net on 84 after good work on the right by Fitzgerald and Ian Flannery, Cahir were full value for putting only three between the teams against a team that has conceded only six league goals all season. Buoyed by this, Anthony Condon was next to come close with another shot on Comerford. Cahirparkafc.com man of the match Dylan Fitzgerald tried hard on a day that little went right for the visitors. Without doubt they will dust themselves down and learn from this episode with their most important game as a youth team just around the corner. The Park Youths marched proudly into the last four in Munster with a convincing win in Passage West on Saturday, the goals coming one in each half from Dylan Fitzgerald and Liam Casey, In the middle, the equalizer from the home side came just after they had been reduced to ten men. The result was fair based on the play with Passage offering less of a challenge than expected in the opening half. Jack Marshall was first into the action on 6 mins when a very promising cross was whipped across the box. Unfortunately there was no-one there to meet it. Cahirparkafc.com man of the match Liam Casey forced a corner on ten. In the ensuing scramble Passage were lucky to come away with their goal intact. With a fine display of goalkeeping yet again, Gearoid Slattery was equal to any quick breaks from the Cork lads as the Park midfield took some time to settle. Keelan Hickey was involved on the quarter hour when his fine floated free found Casey at the far post, his header just squirting wide. Down the right wing a Mikey O'Connor clearance, in front of the capacity crowd from both sides, was accurate enough to allow a sharp Dylan Fitzgerald feed Marshall for another shot on goal. Another low-flighted free on 33mins from Hickey found the head of Casey again - now a real thorn in the Passage side. His delicate with the outside of the left boot just outside the post. Cahir's well-desrved lead goal came on 38 mins with Dylan Fitzgerald, working tirelessly on the wing, first to react to a ball pumped into the square by Stephen Duggan, having another strong performance on the opposite flank. Niall McKenna and Ian Flannery bossed the midfield as the half-time whistle approached but there was stilll time for another Duggan thunderbolt and a quick break from the home team from a long kick-out, which was dealt with efficiently by an Aaron Murphy header away from the centre of defence. With both sides committed to a good footballing performance and some lovely passages of play evident from a well-coached Passage side, it came as no surprise that there was a strong reaction to an inept first 45 from them. Straight away they attacked Slattery's goal but he was not to be easily beaten today, the effective Eamon Gleeson completing the clearance to start another attack for the visitors. With Donal Reade on, Cahir had another provider for the hardworking Marshall and Casey up front - a long-range shot from the former the best of the early pressure. ay was also no surprise that it was a busy day for Tezi Opala in the home goal. After a trademark quick break from defence, Town were almost in front on 18. In truth in this period, Arklow were well on top and would have been full value for a goal. Kevin Griffin cleared a ball off the line from a corner as the Wicklow men began to turn the screw. In glimpses, Cahir showed the quality football everyone expected of them with deft footwork particularly from Flannery in midfield. However, a defensive mix-up capitalized upon by the home team secured a deserved equalizer for the Passage boys with Shane Burke finishing a Thomas Murphy assist, this just after an incident at the other end had seen their keeper red-carded after he had reacted with a stamp on Casey after both had clashed in a one-to-one in the box, Passage now reduced to ten for the last thirty five mins. True to form though, the Park were not allowing Passage take the control they had threatened . With David Finnane returning to torment the home defence, Cahir were once again on the front foot. On 63 mins the deserved lead goal came with a delighted Casey, booked for exhuberant celebration, reacting first to Reade's through ball to punish the home side and return the balance in the visitor's favour. The Casey-Finnane dup worked well with Marshall up front, keeping the ball in the opposition half for the most part. Indeed Finnane could have got his fifteeenth of the season with a piledriver just going over with twenty left. Not to be outdone, ten-man Passage played with great heart and determination and did have several opportunities to equalize but Cahir were not letting this one go. With Anthony Condon added to the mix it was mostly the visitors for the remaining passages of play, Fitzgerald having the best of the attempts with a rising header as the minutes ticked away until final jubilation for a fine away support. In the process Cahir Park go into the last four with a trip to Avenue United of Ennis on the cards in the semi-final. Well-focussed by manager Pakie O'Dwyer and well-coached by Jason Coffey, Jim Buckley and Keith Edwards, Cahir - the sole survivors from Tipperary - join the cream of Limerick, Waterford and Clare in that last four - who knows where their fantastic team spirit, talent, determination and dedication may carry them...? With atrocious conditions underfoot, quality ball-play was never going to be a feature of this tie, moved from Clonmel to accommodate the Cork City / Longford Town pre-season friendly. Four goals from the visitors against an understrength home side was indicative of the gulf between the teams on the day with Town's midfield controlling the game. Greg Henry, Thomas Fitzgerald and a Michael Connolly brace provided the goals that keep the pressure on St Michaels currently at the top of the Youth League table. Cahir had the first chance in the game with the speedy Anthony Condon close. On 22 Jack Marshall also came close to breaking the deadlock. Gearoid Slattery though, was to be the busier keeper with Clonmel at times able to penetrate the Park defence at will. With a fine performance, Slattery was equal to the challenges until the 28th min. Town were ahead at that stage with Greg Henry following the ball in after a Slattery parry. Six mins later, he was in action again, foiling another challenge when one-on-one with Kevin Fahey. With chances at both ends, the Park defence in particular was on occasion under severe pressure. However strong defending from Aaron Murphy and Eamon Gleeson saw Town's best efforts prove not good enough. That was until the fortieth minute when a fine break down the left wing followed by an accurate cross allowed Thomas Fitzgerald in to poke home. Another smart strike by Fahey had Cahir troubled as Town began to turn the screw. With the Park under pressure, John Lyon's half-time whistle was a welcome break to consolidate and plan for a more effective second spell. Cahirparkafc.com man of the match Ian Flannery strung together some fine passes to allow further minor attempts from Duggan and Condon to have further chances to bring the home side into the game. A good day at the office for Henry and Colman Kennedy meant the Town defence was well on top as the half wore on. With 63 mins on the clock, Kevin Fahey was again involved providing a pass for Connolly to finish to the corner of the net with a class effort across a despairing Slattery. Finding it hard to string a good move together, Cahir were now second best, although individual performances from Eamon Gleeson and the returning Kieran Davis were creditable on the day. A corner from Flannery saw a good chance for Stephen Duggan to shoot over with 12 mins left. A defensive mix-up capitalized upon by the visitors from Wicklow was enough to see Arklow Town secure an away win in the FAI Cup for under 17s at Ardfinnan Road, Cahir on Saturday. In the process Cahir Park exit at the last sixteen stage. The result was fair based on the play with Arklow bossing the first half but the home side coming back well in the second with a performance full of heart and determination. The Park, playing in a change of yellow and blue, just came up short on finishing, despite some very clever intricate passing football. Niall McKenna was first to show well for the home side and had goalkeeper X troubled within the fiirst seven mins. Cahirparkafc.com man of the match Ian Flannery was next in line, after winning a strong challenge, just managed to clip the ball over. An Aaron Murphy header from close in after a corner could easily have had Cahir in front but Aaron Jackson managed to get his fingertips to it. With both sides committed to a good footballing performance and some lovely passages of play eveident from a well-coached Arklow side, it was also no surprise that it was a busy day for Tezi Opala in the home goal. After a trademark quick break from defence, Town were almost in front on 18. In truth in this period, Arklow were well on top and would have been full value for a goal. Kevin Griffin cleared a ball off the line from a corner as the Wicklow men began to turn the screw. In glimpses, Cahir showed the quality football everyone expected of them with deft footwork from McKenna, Flannery and Keelan Hickey in midfield. Griffin, always in charge at the back, cleared for Liam Casey with 20 gone, his strong run forcing a corner. Immediately from this, a strong punt upfield put the viisitors on the front foot. An attempted clearance was fumbled, Ciaran OReilly, the greatful winger took full advantage to cross for Ryan Murray to eventally fire home through a crowded area after 26 mins. With 33 mins gone, the best spell in the first half for Cahir culminated in a hardworking Stephen Duggan win a free. Unfortunately for the sizeable, vocal home crowd there was little to cheer after Hickey's free went flying over the bar. Anthony Condon, involved in some smart passing with Casey on the left, put in a great ball for Duggan's piledriver to pressurise the Town defence, the sting taken out of it by a timely intervention by Dylan Orr to allow time for the keeper to clear. Cormac Looby, breaking from his defensive berth was always a danger with Mikey O'Connor's aerial threats putting Arklow under pressure from several set-pieces. The early second half pressure, with a 48th min going over, came from Arklow. This was quickly mopped up by the Park, playing with a new-found vigour. Hickey was far more involved and a fine solo run ended in a free for the home side. From this, O'Connor was again close, the 58th min header glancing off the outside of the post. Not to be outdone, fellow centre-back Murphy had another great attempt go close from another corner, many now awarded to the dominant home side. A tiring Condon was replaced on the hour by the effective Chris English who added another attacking outlet for the midfield to aim at. He was also responsible for an important defensive clearance on the edge of the box with Jack Watson in possession and about to pull the trigger. Scorer: Liam Casey 49The wind was the decisive factor in this clash of the Premier Division's current top two, the Park coming away with nothing from a game of two halves in which weather and Duneske's pitch conditions had the greatest say on which team were on top in either 45. The visitors were first to score with Dean Thompson converting from the edge of the box in a game where Michael's should have seen them be up by more by half-time. In one of the few real chances for the home team, Niall McKenna, cahirparkafc.com man of the match Dylan Fitzgerald and David Finnane worked well together to fashion an opportunity for the latter, only to see his attempt foiled by the opposing keeper. After a half-hour had elapsed, Saints were two up, Ger Carey taking advantage of the wind and lax defending to finish directly from a corner. Another corner from the opposite side moments later had home supporters hearts troubled but Tezi Opala claimed the cross confidently. In much the sane way a 42nd min free from shooting distance was also taken care of by the busy Polish netminder. Two mins later, Mikey O'Connor's clearance from defence was passed on to David Finnane to chase down the right. In pain, Finnane pulled up abruptly and the team's top scorer was immediately substituted with a hamstring injury. In the second half, the Park's work ethic was totally different, challenging for every ball and playing a high line to pressurise the Tipperary outfit at will. Liam Casey had just one goal between the sides four mins in, finishing well with a header at the far post from the accurate corner from the boot of Fitzgerald. At the other end, a sharp Kevin Griffin was alert to a Saints corner to clear off the line to Anthiony Condon on the left. Playing with far more confidence now, the home side laid siege to the Michael's goal with Condon's well struch effort well saved. Three mins later Cahir were level - or so they thought - with Mikey O'Connor powering home a header only to be ruled guilty of pushing in the box on his way, the goal disallowed by ref Michael Cody. A strong defence with O'Connor and powerhouse Eamon Gleeson, aided by sub Lorcan Blake on the right were in control as McKenna and Casey took more grip on midfield. With Fitzgerald and Condon raiding the wings and Jack Marshall sharp up front with Duggan, the tide was indeed turning. Condon had another effort cleared off the line with 65 gone and Cahir full value for the equalizer. Working hard to get the winner, the Park were extremely unlucky to lose out with another attempt cleared off the line. O'Connor had another free over with ten to go. The final effort of note was for Duggan to have a header on target from a Condon assist as time finally ran out on a brave effort. Next Saturday at the Park, Arklow Town make the long journey south to take on the boys in the last sixteen of the FAI Under 17 Cup, the action beginning at 2pm. Cahir were early into the game and a piece of Stephen Duggan trickery on the left allowed Jack Marshall pass to Casey to shoot over for the first real opportunity. With both sides committed to a good footballing performance it was Inishvilla who would have the best of the next five mins. Luckily for visiting fans though, Gearoid Slattery in goal was in fine form and a back four of Keelan Hickey, Mikey O'Connor, Eamon Gleeson and cahirparkafc.com man of the match Cormac Looby were well in control. A corner for the hosts whistled past Slattery's post with twelve mins gone and Gleeson had to be in top form to clear a cross from another strong run by Eoin Fallon moments later. With Cahir having trouble clearing their lines and dominating midfield, the defence were under pressure again on 17, Slattery collecting at the feet of an inrushing attacker. A David Finnane header was next to cause trouble for a jittery back-four, the effort well saved by Chris Harrington. With the game ebbing and flowing, O'Connor had to be in full control with yet another home corner pressurising the Park rearguard. Deservedly though, on the balance of play, the first goal was to come at the other end, with a clearance making the most of the wind, finding Casey on the edge of the box. He calmly took control of the ball and rounded Harrington to put Cahir one up. On the half-hour, a Casey piece of magic let Duggan in to cross in front of goal where an inrushing Marshall, between two sliding defenders, was unlucky not to connect. For their part, the West Cork outfit kept plugging away and Slattery had to be bright once again to claim from another corner whilst at the other end, one of countless offside decisions foiled Marshall's latest attempt. To bring the sides to the break, a promising run on the right from Looby found Finnane whose cross was wasted in the box - the visitors just about good value for their lead at the break. An O'Connor header from a corner cleared off the line signalled Cahir's intentions for the second half with three quick corners conceded by the home side. Within seconds though, a fast break almost secured the equalizer for the AUL Premier League outfit wih keeper Slattery on the ground injured in a challenge, the ball ricocheted off a defender onto the top of the Cahir crossbar. Inevitably, this gave heart to the hosts as they continued to turn the screw. A tiring Duggan was replaced by a livewire in Anthony Condon, his runs on the left providing a welcome breather for Ian Flannery and Niall McKenna's defensive duties in the centre of the park. However, the Inishannon side did manage to break through on the hour and a succession of free kicks conceded by Cahir within striking distance of the goal almost spelt footballing suicide with the best struck effort on 62 mins cannoning off the crossbar with Slattery stranded. Sensing they had got out of jail, Cahir upped the tempo for the next quarter hour, Harrington busy pushing away a well-struck Gleeson effort on 70 mins. This was followed up by a Casey chance which deserved better. With the manager /coach combo of Pakie O'Dwyer and Jason Coffey putting on Donal Reade for McKenna, the Park side began to take the opportunity to strangle the game, the home side having spent as much energy as was available. With Reade upended, the Cork wall held well to foil Hickey's free kick but the game was about to come to an inevitable conclusion. Finding himself up front, an Anthony Condon speculative cross come shot after 78mins flashed past Harrington to kill off the challenge of a gallant home team. Kevin Griffin replaced Looby to see things out whilst Finnane took advantage of another through ball to give a travelling support something to cheer about in the biting cold, his delicate chip coming up short. Like the team bus, the game failed to spark to life until the final stages. It saw Cahir meet Two-Mile-Borris for the second weekend in a row, this time in the league at Newhill Park. Proving there was seldom little between the teams, the game finished on exactly the same scoreline as the previous encounter, Jack Marshall providing the goal for the Park. The early parts of the game saw the visitors put up the challenge to the home side, Liam Casey working hard on the left wing for Donal Reade to level for Jack Marshall to have the first real shot in anger. An impressive cahirparkafc.com man of the match performance by Ian Flannery saw him have a shot off target from 20 yds out with 16 mins gone. Against the run of play, the deadlock was broken on 37 mins, after he broke free on the right wing, Daniel Rafter was in the right place to get the better of Tezi Opala in the Cahir goal. Quickly back in to the action, Stephen Duggan came close for Cahir when he fired just past the past with 24 gone. After a strong and determined run on the left, Flannery was once again close, the shot rebounding for Casey to have a second go but to no avail. One sensed the never-say-die attitude of St Kevins was going to pay dividends as they mopped up all that Cahir had to offer, on a day when strong desire, quality passing and shooting accuracy seemed to have eluded them to an extent. As John Teehan blew for the start of the second half, Cahir were however showing much more of their old selves, pinning Kevins to their own half for the next quarter. With Dylan Fitzgerald on and opening up the flanks, David Finnane and Mikey O'Connor having a more attack-minded brief and Keelan Hickey stategically moved to the middle of the park, it came as no surprise that the next efforts were all from the Park. First Jack Marshall came close with two attempts of note, Casey and Finnane providing the assists. Then Finnane, having more space down the right, crossed for Fitzgerald to shoot and shortly afterward to provide the ball for Casey's looping effort. A confident catch by Opala, claiming in his area in the next passage of play fed an impressive Cormac Looby to start the next attack. From this Reade fed Casey who put in Eamon Gleeson for him to have a shot, unsuccesfully however. The incessant pressure did however pay back finally with 82 mins on the clock with Marshall finishing strongly after the keeper parried a goal-bound Flannery volley. As the end came within sight, there were two more efforts to note - first Fitgzerald freeing Finnane to shoot over when through and then the final one of the day, as the ball miraculously ended up rolling along the Kevins goal-line before being cleared to safety to secure a point for both sides. A trip to Inishannon to meet Inishvilla FC is the next game for the Park Youths, this Saturday at 2pm in the Munster Youth Cup last sixteen. An heroic performance by Gearoid Slattery in goal saving four penalties and scoring the decisive sudden-death penalty brought Cahir Park into the fourth round of the Munster Youth Cup in a game played in constant drizzle at a very wet Ardfinnan Road on Saturday. Liam Casey's bulleted diving header from a David Finnane corner-kick had got the home side ahead on 33 mins but a tireless performance from the vistors saw them come back to equalize in the second half after a mazy run from defence by John O'Connor saw him upended in the opposition's area. A confident catch by Slattery, claiming in his area in the first few minutes signalled the start of a good day for him. This, allied to a cahirparkafc.com man of the match performance by Mikey O'Connor who, with Aaron Muphy and Keelan Hickey, along with the bright Eamon Gleeson, were always ready for whatever Borris had to throw at them. Borris too had plenty of purple patches in the game bringing an end-to-end feature to the middle third of the game in particular. Finnane created a great chance for the home side on 18 mins, his shot clipping the stanchion. Captain Casey was aware again to put the Borris defence under pressure with a delicate chip almost beating the visiting keeper on 25 mins. On 33, the deadlock was broken with Duggan and Finnane combining to force a corner, this taken by the latter and placed directly for Casey to head home strongly at the near post from four yards. With one Aaron replacing another at the break - May for the injured Murphy - the lads from Borris took control for the first ten mins or so and could well have equalized as the game deteriorated due to the heavy pitch making it impossible to keep the ball moving for any length of time. A drab second half was lit up though by the wonderful run from O'Connor, setting out from defence and worming his way past four Cahir men before been taken down in the Park box, Ashley Laslett providing the necessary finish to bring things even. Try as they might the Cahir boys, spurred on by a fine performance from Ian Flannery in the engine room and Dylan Fitzgerald on the flank, kept up the effort but to no avail. At the other end, Borris were nearly ahead, O'Connor breaking through once agin to crack one off Slattery's crossbar. Buoyed by the capture of the Youth Division Two title, the visitors gave as good as they got. A Finnane shot wide and a Jack Marshall effort spurned by an excellently-timed tackle brought the game proper to a close, honours even. The first ten of extra time provided little of note but for a serious injury to one of Borris' key players. In the second an impressive sub Donal Reade provided a through ball for the speedy Marshall to come close once again. A scything tackle on Casey saw the visitors reduced to ten men, John Lyons dismissing for a second yellow card. To be fair to both sides this was not represenative of the game, the Christmas goodwill extending to New Year's Eve. Inside the final five it was all Cahir, a Casey shot miraculously cleared off the line and a one-handed save finally foiling the home team's attempts. With the 110 mins not providing a winner, it was down to penalties and Slattery's time to shine. With six penalties gone, it was still 1-1, Casey the only one to convert for the home side. With the regulation five each taken, it was 2-2, Finnane adding to the scoreline. With Marshall and O'Connor on target to bring it to 4-4, the tie was left to Slattery to at first save, and then convert, the decisive penalty of the day. A trip to Inishannon to meet Inishvilla FC is the reward for the effort, the tie to be played early in the New Year. A David Finnane hat-trick and an early header from Liam Casey were enough to give the Park a 4-3 away win in the FAI Cup for under 17s at Rosleighan Park, Portlaoise on Saturday. This could best be described as a game of three thirds with the visitors bossing the first hour and the home side, courtesy of some strategic changes, having the most of the last half-hour. On balance the result came right for a game Cahir side who create club history taking a place in the last sixteen in Ireland with this win. They face a home tie against against Skerries, Maynooth or Arklow in the New Year. With both sides committed to a good footballing performance it was a Finnane cross in the early minutes which found Casey alert to head home. Casey was close agin on eight, the Park quick out of the blocks. In truth in this period, Portlaoise had little to offer and there was 18 mins gone before they had a strike on target, the ball collected easily by Tezi Opla. Cahirparkafc.com man of the match Mikey O'Connor was in full control with Aaron Murphy in the centre of defence whilst Cormac Looby and Keelan Hickey were their assured selves on either side as the visitors mopped up anything of substance from the home side. Up front, an Anthony Condon speculative shot after 33 had Darren Territt in the home goal worried. In the middle of the Park, Niall McKenna and Ian Flannery played some great one-twos and held possession under pressure. It was the former who provided a neatthrough ball for the second, an impressive Stephen Duggan helping the ball on for Finnane to lash home his first of three for the afternoon to give a travelling support something to cheer about in the biting cold. An O'Connor header cleared off the line as the end of the half beckoned whilst the last chance saw Casey feed Finnane whose effort was smothered by Territt. With eight mins of the second half gone, Finnane was once again on target. The dynamic captain Casey was 100% accurate with a ball to his Finnane's feet as he strode down the left wing and let fly a rasper into the top corner from an acute angle from all of twenty yards out. A tiring Flannery was replaced on the hour by Lorcan Blake with Chris English coming on for McKenna. The next passage of play brought about the turning point of the game when the home team's substitute Dillon Cleary passed upfield to find a Park defence in a muddle allowing Sean Mulhall to press the ball home in the 76th min., this after their talisman Emmanuel Okpara was dismissed after a kick-out at Casey. The last throw of the dice was for the Park was for the manager /coach combo of Pakie O'Dwyer and Jason Coffey to put on Kevin Griffin for a hard-working Looby. As Cahir began to lose composure the unthinkable happened with a second scored by the home side with less than five left, Conor O'Sullivan pushing the ball past Opala. A gallant Cahir team had only themselves to blame to lose a third goal in a game in which they were cruising, the defence at sixes and sevens to allow Cleary in to finish to the net on 94 mins. Was the game about to slip away from them altogether? After an amazing six mins of extra time the referee's whistle blew to take the tie to 10 mins a side extra. In extra-time, Hickey, Casey and Condon played their way out of defence to put Finnane in, his shot flying over. However his next effort was to bring better luck. With typical strength he forced his way into the box and shot unstoppably across Territt to break the home hearts for his fourteenth competitive goal of the season, three mins of extra-time gone. As Cahir returned to the confidence of their earlier display, it was they who were likely to add to the goal tally as the game petered out, Duggan unlucky not to add to his goal tally with the last real effort of consequence when a Casey-Blake-Duggan three-man-move saw Stephen make room along the end line only to have his attempt saved well by Territt. <?<ST2:PERSONNAME w:st="on"><?<ST2:PLACE w:st="on"><?<ST2:PLACENAME w:st="on">Bansha / Donohill 2 Cahir <?<ST2:PLACETYPE w:st="on">Park 5Scorers: Jack Marshall 4, David Finnane 44, 54; Lorcan Blake 70, 74With fifteen points out of eighteen, it has been a fantastic start to the Youth teams season under Pakie O'Dwyer, Jason Coffey and Jim Buckley. The latest episode, away to Bansha/Donohill in Donohill on Saturday, produced another five goals with a brace each from David Finnane and Lorcan Blake adding to an early strilke from Jack Marshall. Playing on a difficult surface, it was not a day for free-flowing football and the Park Youths had two early chances from frees foiled by a hard-working Bansha defence. In the fourth min though the pressure paid off with Liam Casey setting Jack Marshall free to plant the ball past an impressive home goalie. With seven mins gone, Marshall had another free header go just over. Then Casey was set free by fine work on the right by Dylan Fitzgerald, Casey's work forcing the first of countless corners on the day. On 13 mins, Donohill had one of many good patches through the game, an accurate free troubling Gearoid Slattery who tipped it just over. At the other end, Marshall was put clean through one on one with the keeper, the conditions adding to his control problems, the keeper gathering unexpectedly. Slattery gathered and cleared a promising Bansha attack on 35 mins, his clearance almost going in at the other end. With Keelan Hickey and Eamon Gleeson in great form at the back and a cahirparkafc.com man of the match performance in the centre of the park by Niall McKenna, Cahir were in control for most of the game always ready for a Bansha break. Another such attack came with five to the break, Darren O'Brien a major threat to the Cahir rearguard in a good spell for the home side. Their own defence was under pressure when a Hickey free went cose with the clearance falling right in to the path of Cahir stalwart and captain, Banshaman David Finnane who finished well. Inside the second half, it was the Bansha boys who struck first, Dinny Crosse converting a penalty when Slattery took down an attacker bearing down on goal, the goalkeeper ending up lucky to receive only a yellow card. Within five mins Cahir were back in front by two again, Marshall working well in a crowded area to create space for Finnane to power home. With the line ringing the changes, introducing three subs to create a new frontline, there was a new look to the atack force for the last half hour - Stephen Duggan spearheading an attack force with Lorcan Blake on the right and debutant Niall Anglim on the left. The defence, coping well, was also allowing Cormac Looby to raid more on the left - he had a good opportunity on 68 mins, forcing a corner, Casey forcing a point-blank save from Bansha's netminder. It was all Cahir at this point, with endless attacks bound to provide more goals. The fourth came on 70 mins, Blake providing the final touch to squeeze the ball between goalkeeper and far post. Four mins later, he was on target again, this time collecting the ball from Marshall twenty yards out and running at the keeper to drill home to his right. In true fighting tradition, the combination refused to lie down and were to be the last to score on the day when an onslaught towards Slattery's goal ended up with tangled legs everywhere and the ball in the back of the net, Luke Dwyer getting the final touch with eight mins left. The Park can now look forward with confidence to a visit to Portlaoise for the FAI Youth Cup game at Under 17 level this Saturday. A Liam Casey hat-trick and a fine solo effort from David Finnane was enough to give the Park a 4-1 home win in the FAI Cup for under 17s at Ardfinnan Road on Saturday. With both sides comitted to a good footballing performance it was a pity that the clash would be best remembered for the lack of composure from the visitors after the home side went ahead in extra time, the Killavilla team finishing the game with eight players. Cahirparkafc.com man of the match Casey was first in to the action when forcing a corner on 3 mins. but it was the strong midfield of United who had the first boast when claiming the ball and threading it through for a sharp Brian Moloney to finish from close range. With the Roscrea side having most of the possession in this period, it took Keelan Hickey to claim some credit for the Cahir lads with a great solo run and shot which was saved by the keeper. To prove it was no fluke, Hickey repeated the run three mins later, this time leass accurate with the final shot. On the half-hour Casey was clean through but for a timely interception from the North Tipp back-four. Mikey O'Connor, changed to the right wing berth, caused some trouble when unleashing a long-range effort on 36 mins whilst Casey and Finnane combined for the last chance of the half, the latter's shot just over. The dynamic captain Casey was 100% accurate with the 47th min spot-kick awarded for a robust challenge on the strong Stephen Duggan on the left wing, putting the home side right back in the tie. Shortly after, Finnane had sub Anthony Condon put through, his shot just off-target. In defence, O'Connor had an important interception, stopping another quick Killavilla break, the ball finally cleared by the dependable Aaron Murphy. With an hour gone and the game ebbing and flowing, Casey and Finnane agin combined to bring a fantastic double-save from the opposition keeper, one from both of Cahir's top scorers. A clearance off the line by a confident Kevin Griffin put an end to premature joy for the visitors and on 65, with the North Tipp team the stronger, it took all of Murphy's might to shepherd over the end-line a promising attack. Tezi Opala was called in to action to smother another promising deadlock-breaker on 77. Casey was once again prominent on 79 turning on a sixpence and shooting wide of the target. In the final mins of normal time, Ian Flannery had the last opportunity to prevent the tie going to extra time but failed. In extra-time, Hickey, Casey and Condon played their way out of defence to put Finnane in, his shot flying over. The deadlock was finally broken on 96 mins, Finnane weaving his way along the side line, crossing for Casey for him to flick past the Roscrea keeper. Frustrated, United began to leave their football behind and were guilty of several rash challenges, yellow cards flashed with regularity in their direction. Just before the end of the first period they were reduced to ten for a second yellow card offence. Losing their shape, United were punished further on 105 with a Finnane solo goal, a cue for further ugly scenes with players from both sides gulity of offences normally not associated with underage soccer in Cahir Park. Tommy Keating, on finally restoring order, booked three more players, one from Cahir and issued a second red to the visitors. Minds elsewhere, it came as no surprise when Flannery was upended in the box for a second penalty to the Park, dispatched with authority by Casey to complete his hat-trick. With two mins left, United were down to eight as the red mist took over some players completely. An unfortunate end to what promised to be a great game of football between two good footballing sides. Cahir's representatives, to their credit, can say their minds remained on the game right to the final whistle, deserved victors at game end. A trip to the winners of Portlaoise AFC or Portumna Town awaits in the third round. A Stephen Duggan hat-trick, great performances from Cormac Looby and a trojan performance from both Aaron Murphy and Liam Casey along with cahirparkafc.com man of the match Niall McKenna saw The Park Youths come away from a sunny but cold second pitch at Cullen with a Youth Cup victory on Saturday last. Up against the same opposition as six weeks ago but with five changes in personnel to start the game, Cahir were comfortable for most of the clash, Casey feeding Duggan for the game's first chance on 3 mins. Making no mistake five mins later, Dylan Fitzgerald and Niall McKenna combined to put the visitors one up. An effective clearance from Looby saw any Cullen trouble mopped up as the hosts made headway through a strong midfield for one of their few opportunities on Gearoid Slattery's goal, the keeper equal to the chance. Ian Flannery's long-range shot was the next Park effort whilst Slattery was once again called on on 16 mins to clear a snap-shot from the Cullen lads. On 26 mins McKenna's header could well have increased the lead after an excellent corner from Donal Reade, the pressure finally paying off two mins later when Fitzgerald was in first to capitalize on a goalkeeping error. The Park lads were surprised on 42 mins when the Cullen-Lattin forwards held their nerve and concentration to put just one goal between the sides again with a free striker allowed time to choose his spot in Slattery's net. In the second half, and with changes imminent, Cahir upped the gear. A cross from Looby from the right was met by Casey's header at the far post allowing sub Marshall a volleyed shot on goal - an effort worthy of a third for Cahir but the home goalkeeper was in control to force the ball for a corner from the tightest of angles. Twelve mins in, Duggan was first to the ball at the far post connecting perfectly with Casey's through ball to put the visitors two clear. Two became three almost immediately after the re-start with a carbon copy of the previous goal. An energetic Marshall was challenged in the small box on the hour and was preventing from scoring a perfect fifth after strong work on the right by sub David Finnane, who had scored all four goals on the last trip to the same venue. With the home defence now carved open at will, right-back Looby took his opportunity to get in on the action, his screamer rising over at the vital moment. With a swift retaliation, the home side could have reduced the deficit but for the trademark headed clearance of the trustful Murphy. With two-thirds of the second half passed, Finnane went on a mazy run, beating five challenges and firing over with a blistering shot while McKenna provided the cross for him to almost head home minutes later. With 72 mins on the clock, Casey made up for early hesitation in front of goal with a great finish when one-on-one with the keeper, the Park now four clear again. Finnane was back in to the action with a quarter-hour left, his shot this time cannoning off the crossbar. The tie was put beyond any doubt when referee Tom Darcy pointed to the spot after a foul on Duggan. There was no other choice to take the kick but the confident Duggan who dispatched the kick past the home goalie who was unlucky not to keep it out with his fingers almost getting to it. Scorers: Dylan Fitzgerald 52, Jack Marshall 88The Park came away from a blustery Community Field in Clerihan with all three points on offer on Saturday in a game the lads dominated for the greater part. With many scoring chances, a combination of wayward finishing, bad luck and a fine performance from the home goalkeeper kept the scoreline to a respectable margin. David Finnane was first to cause danger in the opening seconds. Within the opening ten Dylan Fitzgerald also had a good chance go wide, the Park also unlucky withJack Marshall's attempt well saved. In response, Clerihan has a couple of forays to trouble new goalkeeper Gearoid Slattery and saw him having a solid day. On 23 the first of Cahir's two disallowed goals, both for offside, hit the net; this followed by a tghrre-man attack from Mikey O'Connor, Donal Reade and Dave Finnane, Finnane's chance going wide. On the half-hour, the Park's strong defence of Liam Casey, Aaron Murphy and Eamonn Gleeson was breached, lucky for them the shot ended up going over. Immediately after, a Fitzgerald shimmy allowed Marshall through, his effort coming back off the keeper and bouncing back into play to be safely cleared. A certain deadlock-breaker looked on the cards on 38 mins with Finnane clean through. Picking his spot to the keeper's left the strong shot seemed goalbound but with keeper beaten, the ball came back off the post. The final moment of note in the first half saw Liam Casey's well struck free-kick saved. With some changes in formation in the second 45, one allowing cahirparkafc.com Eamon Glesson free to maraud the right wing, Cahir began to force their game once again, Gleeson connecting to bring a good save from the Clerihan keeper after a Keelan Hickey corner. After six mins of the second half the first goal finally arrived - an innocuous effort from Fitzgerald bounced underneath the keeper's body and ended up in the bottom corner. A fine break from midfield saw Gleeson enter the box, a shot deserving more squirming wide. With Stephen Duggan on, no time was wasted to involve him, a quality cross provided an opportunity for Marshall to head over. 74mins almost brought the second goal of the game, Gleeson again involved to ptovide the cross for Finnane's header. With the game petering out, the Park had to be careful not to push too far forward and allow Clerihan in for an equalizer. An important intervention by first Murphy and then O'Connor broke down a promising effort from the home side. With 88mins on the clock, Finnane had a late chance saved well. There was however, a chance for an even later effort as Marshall was first to attack the final corner of the game to power home a header for Cahir's illusive second goal of the day, Hickey providing the important cross. <?<ST2:PLACE w:st="on"><?<ST2:PLACENAME w:st="on"><?<ST2:PLACETYPE w:st="on"><?<ST2:PERSONNAME w:st="on"><?<ST2:PLACE w:st="on"><?<ST2:PLACENAME w:st="on"><?<ST2:PLACETYPE w:st="on">Ian Flannery, <?<ST2:PERSONNAME w:st="on"><?<ST2:PLACE w:st="on"><?<ST2:PLACENAME w:st="on"><?<ST2:PLACETYPE w:st="on">Liam Casey, Jack Marshall. The Park came away with nothing from a wet Cooke Park on Saturday after dominating the majority of the game. Playing a nice brand of passing football in the extremely difficult conditions, it was a defensive lapse in concentration that allowed the winner on 81 mins. Before that Jack Marshall had finished well from a great pass from Donal Reade who, in turn had been fed through by an impressive Dylan Fitzgerald. The first goal of the day, a third min penalty, saw Michaels exact full retribution for Tezi Opal's challenge on an onrushing forward. After that David Finnane and Liam Casey had combined on two occasions to try to find an equalizer after the quarter-hour, Casey's headers over on both attempts. A penetrating run from the home side after 20 mins had Opala aware whilst a cross-come-shot from cahirparkafc.com man of the match Mikey O'Connor could have produced more just inside the half-hour. A strong defence with O'Connor and powerhouse Aaron Murphy were always in control at the back while surging runs from Keelan Hickey added to an attack which lacked quality finishing in the final third. The equalizer was in a different class however with a clearance from dependable Eamon Gleeson working its way through midfield, a speedy Fitzgerald breaking the ball for the always-involved Reade to push the ball through for Marshall to finish strongly. Substitute Ian Flannery asserted himself quickly to the conditions and had a fine attempt on goal with an hour gone. He then combined with O'Connor, earned a free and from this, Finnane was unlucky. As the game wore on, and only one team looked like winners, there were further efforts from Flannery and a Keelan Hickey free-kick, going just over. Working hard to get the winner, the Park were extremely unlucky to lose out to the quick Michaels break on 81 mins, a finish at the far post going disappointingly unchallenged. The wind blown from their sails, Cahir's final chances saw them come closer than they might have thought to claiming what would be an equalizer. Lessons learned for the future, this band of youths can take great heart from this fine performance against one of this season's favourites. <?<ST2:PLACE w:st="on"><?<ST2:PLACENAME w:st="on"><?<ST2:PLACETYPE w:st="on"><?<ST2:PERSONNAME w:st="on"><?<ST2:PLACE w:st="on"><?<ST2:PLACENAME w:st="on"><?<ST2:PLACETYPE w:st="on"> Niall McKenna, <?<ST2:PERSONNAME w:st="on"><?<ST2:PLACE w:st="on"><?<ST2:PLACENAME w:st="on"><?<ST2:PLACETYPE w:st="on">Liam Casey; Jack Marshall. <?<ST2:PERSONNAME w:st="on"><?<ST2:PLACE w:st="on"><?<ST2:PLACENAME w:st="on"><?<ST2:PLACETYPE w:st="on">Scorers: Anthony Condon 30, Stephen Duggan 32, Mikey O'Connor 51 </FONT></P> <P align=center><?<ST2:PERSONNAME w:st="on"><FONT color=#000000 size=1><?<ST2:PLACE w:st="on"><?<ST2:PLACENAME w:st="on"><?<ST2:PLACETYPE w:st="on"></FONT> </P> <P align=center><?<ST2:PERSONNAME w:st="on"><FONT color=#000000 size=1 face=Verdana><?<ST2:PLACE w:st="on"><?<ST2:PLACENAME w:st="on"><?<ST2:PLACETYPE w:st="on">It's not too often we have visitors to the Park from Offaly, but such was the case on Saturday as Birr Town came to challenge in the first round of the nationwide FAI Under 17 Cup. Evenly contested for large parts of the game, Birr certainly had a lot to offer by way of competition to the home side's flowing football.</FONT></P> <P align=center><?<ST2:PERSONNAME w:st="on"><FONT color=#000000 size=1 face=Verdana><?<ST2:PLACE w:st="on"><?<ST2:PLACENAME w:st="on"><?<ST2:PLACETYPE w:st="on">Anthony Condon, starting his first game at this level certainly did not look out of his depth. Both he and captain Liam Casey haad early chances to net when put through by fine passing of Ian Flannery and David Finnane, both splitting the visitors defence with accuracy.</FONT></P> <P align=center><?<ST2:PERSONNAME w:st="on"><FONT color=#000000 size=1 face=Verdana><?<ST2:PLACE w:st="on"><?<ST2:PLACENAME w:st="on"><?<ST2:PLACETYPE w:st="on">Casey broke through on the quarter hour but shot over when it seemed easier to score, at the opposite end Birr showing potential with a shot of their own to trouble Tezi Opala. This was one of Town's bright spells, the Park pinned back and under pressure. The rearguard held well though, with Mikey O'Connor, Keelan Hickey, Cormac Looby and cahirparkafc.com man of the match Lorcan Blake in fine form.</FONT></P> <P align=center><?<ST2:PERSONNAME w:st="on"><FONT color=#000000 size=1 face=Verdana><?<ST2:PLACE w:st="on"><?<ST2:PLACENAME w:st="on"><?<ST2:PLACETYPE w:st="on">Against the run of play, the deadlock was broken - Cahir in a lapse of concentration, allowing Mikey Ryan in to deflect a shot that wrongfooted Opala.</FONT></P> <P align=center><?<ST2:PERSONNAME w:st="on"><FONT color=#000000 size=1 face=Verdana><?<ST2:PLACE w:st="on"><?<ST2:PLACENAME w:st="on"><?<ST2:PLACETYPE w:st="on">The equalizer came six mins later - a corner forced on the left was pushed away for a second on the opposite side. A quality cross from Flannery found the head of the inrushing O'Connor to power towards goal. The keeper parried the ball into the path of Condon, allowing him score with the easiest of finishes, from three yards. <?<ST2:PERSONNAME w:st="on"><?<ST2:PLACE w:st="on"><?<ST2:PLACENAME w:st="on"><?<ST2:PLACETYPE w:st="on"> David Finnane<?<ST2:PERSONNAME w:st="on"><?<ST2:PLACE w:st="on"><?<ST2:PLACENAME w:st="on"><?<ST2:PLACETYPE w:st="on">; Stephen Duggan, <?<ST2:PERSONNAME w:st="on"><?<ST2:PLACE w:st="on"><?<ST2:PLACENAME w:st="on"><?<ST2:PLACETYPE w:st="on">Liam Casey. With wet conditions underfoot, keeper's handling would always play a major role in this pulsating clash at the Complex on Saturday. Early Cahir pressure saw them go ahead but after that, it was a story of set-pieces to divide the sides. With a free-kick getting the Clonmel side back in the game and then in the second half a penalty for each side, one of which was saved and turned out to be the turning point of the game, the other scored...by a goalkeeper. The game was just 2 minutes old when Liam Casey's turn on the edge of the box allowed him space and time to pick his spot and see his left-foot shot end up in the corner of the Town net.Within five mins Stephen Duggan had his first attempt of the day on target. With chances at both ends, the Park defence was on occasion under pressure. However strong defending from Aaron Murphy and Eamonn Gleeson saw Town's best efforts prove not good enough. That was until the fifteenth minute when a fine Harry O'Connor free-kick from all of thirty yards ended up in the top corner of Tezi Opala's net, an equalizer of true quality. On 25 mins, Keelan Hickey's break down the right wing ended in an accurate cross for Casey to work the keeper but see his effort crash over. Ten mins later, another free-kick sliced open the Town defence, allowing Jack Marshall's shot on the keeper slip underneath him but go wide. Two mins later, Cahir's best chance to hold a half-time lead came about. After good work by Duggan forced a corner, Eamonn Gleeson's strong header went whistling just over the crossbar. Cahirparkafc.com man of the match Ian Flannery strung together some fine passes to allow further minor attempts from Casey and David Finnane, whilst timely tackling from Dylan Fitzgerald set up a couple of further chances to see Cahir go in at the break in the ascendancy on everything but the scoreboard. Solid challenges from Mikey O'Connor kept Town at bay as an expected early second-half onslaught came to pass, Harry O'Connor's the pick of the bunch. A four-man move between Murphy, Marshall, Hickey and finally Duggan saw him shoot wide of the Clonmel goal, the visitors signalling an intention to make every attempt to reach the next round. A great chance followed for Liam Casey, his normally pinpoint-accurate free-kick cannoning off the home wall and deflecting on to the crossbar. Straight after, the Park's best chance to go ahead came with Casey upended in the box, Finnane stepping up to take the penalty but unfortunately shooting right at the left-hand dive of the Town net-minder. A couple of changes in personnel later for both sides saw the complexion of the game change - Town taking it to Cahir for the best part of the next quarter-hour. When awarded a penalty on 66 mins, Clonmel confidence was high, their substitute keeper dispatching with confidence past Opala. Fitzgerald, Stephen Duggan; David Finnane, Liam Casey. Scorer: David Finnane 25, 37, 59, 72 With fourteen goals scored and three wins from three, it has been a fantastic start to the Youth teams season under Pakie O'Dwyer and Jim Buckley. The latest episode, at home against Clerihan on Saturday, produced four goals for a free-scoring David Finnane in a game largely controlled by the home team. Playing in wonderful sunshine, the Park Youths had two early chances from frees foiled by a hard-working Clerihan defence. At the opposite end, on twelve mins, Finnane was back to clear a good opportunity to score from the visitors. Liam Casey came close shortly afterward, placing a ball to the keeper's left, this after an intelligent, accurate pass from Aaron Murphy. Casey, aiming for exactly the same spot, brought a great save out of the Clerihan keeper on 22. The first goal came three mins later, a headed pass found Finnane in space and his first of four was finished confidently. Cahirparkafc.com man of the match Stephen Duggan had the next shot in anger, his effort skimming the post. Tezi Opala, on a day when he was seldom brought in to the action, had to be very much awake on the half-hour, when a great looping header had him very close to beaten. With amazing agility, he backpedalled and touched the ball on to the underside of the crossbar. Ian Flannery, in fine form throughout the game with a doggedly aggressive performance in the centre of midfield, continued to supply good ball to the forwards, one of these allowing Jack Marshall through to almost increase the lead. Another broke through the Clerihan defence, the stray ball falling to a confident Finnane to stroke home for a two-goal lead. The lead was quickly reduced to one when a stray back-pass was intercepted by the sharp forward, Opala given no chance to save. Inside the second 45, Casey's good work and quality pass had no-one in the box to convert it when the Cahir superiority deserved something more on the score-sheet. A similar move, as the hour mark approached, however, did see Finnane break free to power home a header at the far post. A great piece of work by Duggan on the right, with quick feet making room for himself to feed Marshall, the latter failing to connect. In his final passage of play before being substituted, Donal Reade was close, an attempt which promised much, rising over. Hat-trick completed and confidence high, Finnane was back to terrorize the Clerihan defence on 73 mins when, starting a run from midfield, he was first to react to a sloppy back pass, finding himself one-on-one with an advancing keeper, he used his strength well to sweep the ball home. A fortuitous penalty decision allowed the visitors back in the game, ten mins left to play, Opala well beaten. Cahir, would however have the final say with non-stop pressure to the end. First off, Duggan fed Finnane, his chance smothered on 86. Then, a mazy run by sub Brian McKenna had Clerihan under pressure. Shortly after, Casey chipped wide from a Finnane cross and then the goalscorer of the day had the final effort with a shot right and wide from a quick free-kick for a shirt tug on the edge of the area. Playing in atrocious weather conditions at times, the Park Youths continued the good start to the season with a fine away win on Saturday at Aisling Park, Cullen. The game was just 15 seconds old when David Finnane's speculative punt caught the opposition keeper unaware to claim a very early lead. Stephen Duggan, having a fine game on the left was next into the action. His quick feet made room for him to have a shot on 10 mins which could well have increased the lead but the shot rose just at the wrong moment. Wayward finishing by the home side saw most of their chances come to nothing, although Tezi Oplala in the visiting goal did have to be alert to some of the efforts. A mobile Park midfield brought the performances from a strong defence and sharp attack together which meant Cahir were always a danger, Ian Flannery and cahirparkafc.com man of the match Dylan Fitzgerald always involved. On 35 mins a rasping shot from an effective Jack Marshall came close to crossing the line, the sharp Finnane applying the fonal touch to put the visitors two in front, a lead which they brought to the break. Early second half pressure from Cahir saw a fine four-man move between Flannery, Marshall, Fitzgerald and finally Duggan once again trouble the hosts. With manager Pakie O'Dwyer ringing the changes, the Park were determined to get their just desserts from the game, subs Keelan Hickey and Niall McKenna taking up just where Mikey O'Connor and Marshall left off, the Park beginning to turn the screw. Opala, playing his part had a quality save to make from a Lattin-Cullen free, cleared confidently by Aaron Murphy. On 61 mins a clearance from Aaron May found Fitzgerald who fed Duggan, his shot smothered by the oppostion's last line of defence. Duggan was through again shortly afterward put through by a mazy run from Liam Casey. From left back, Cormac Looby got in on the action, making room for himself to put in a fine effort on goal, this followed by sub Lorcan Blake's effort on goal when cutting in from a left wing berth. Cullen, determined tio get something from the game had Opala troubled on 68 mins but shortly after there were three between the sides - Blake's run down the left set up Casey to play a one-two with Finnane and finish with aplomb. With the game petering out, a 73rd min innocuous incident saw Fitzgerald dismissed for a second yellow card. Playing on with great heart, the ten men put a fourth between the teams, a fantastic solo effort from Finnane saw him come in from the right wing and muscle his way through defence to place the ball to the keeper's left. Fine start to the season for the youths. A great performance, winning 6-3 in a game in which the lads were always in control. Liam Casey scored four of the goals for this young side with David Finnane adding one and cahirparkafc.com man of the match Stephen Duggan scoring from a rebound from 2yds on 40 mins, Shane Dunne with two and David McKay replying for the hosts who finished with ten men. Dugganl; David Finnane, Liam Casey. With both sides having periods of control, Nenagh felt comfortable of taking the silverware as the game entered extra time. However, a goal to equalize from the South Tipp boys and Mark Shortt's interception and solo goal from that kick-off meant the Cup headed to Cahir in the most unlikely of circumstances. Team: Evan O'Dwyer, Pa Fitzgerald, Colm Nugent, Seanie Kiernan, Mark Shortt, Seamus Reade, Aaron Cowan, Dean Lonergan, Cormac Crowe, Craig Condon, John O'Donnell. Subs: Keelan Hickey, Ian Flannery, Eoin Quinlan, K. O'Brien, Tommy Sweeney. Scorer: John O'Donnell. Good news for the Youth team on Saturday in the Youth Cup semi-final. The game started well for Cahir Park as they put pressure on Peake Villa from kick-off. With Aaron Cowan unfortunate not to make it 1-nil at the 10min mark, with a low left foot shot on goal which was saved by the keeper. Cahir Park had a lot of possession in the first half with their midfielders dominating the game and were unlucky that some fine passing didn't being about a score. The second half started well for both sides with Peake Villa defending well and only for a save from keeper Evan O'Dwyer, Peake Villa would have been one up. From then Cahir put a lot of pressure on Villa and were rewarded on the 86th min when centre half Sean Kiernan scored after a corner when he hit a low shot past the keeper to give Cahir a 1-0 lead. Other chances were had with shots hitting the post and the Villa keeper making some saves but the game ended 1-0 in the hosts favour, Cahir Park qualifying for the Youth Cup final. The Park's man of the match was Aaron Cowan.